Though many of our winter and spring sports are outdoor sports and aren’t played on school grounds, the fields we use have a unique history of their own. The baseball team uses Fiscalini Field for practice and home games. The 3,500 capacity field is located only 15 minutes away from CSUSB, right off of East Highland Avenue. Fiscalini Field was first built in 1934 and originally named after Fredrick Thomas Perris, who helped construct the early stages of the city as a railroad developer. 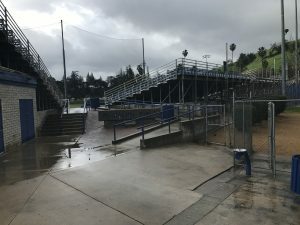 The field was then renovated in 1993 and renamed after city native John Fiscalini, who found success playing for San Bernardino High School, Cal Berkeley and the Pittsburgh Pirates. As Perris Hill Park, the field was used by the Pittsburgh Pirates and the St. Louis Browns for spring training from 1935 to 1953. The 1988 film “Stealing Home” featured Fiscalini Field in the opening and closing scenes of the movie. The minor league baseball team, the San Bernardino Spirit was in season and using the field at the time it was featured in the film as well. The track and field team, uses the track located right by the softball field. The team holds practice there but in the event of bad weather conditions they then train in the Coussoulis Arena. Track and Field doesn’t hold any of there own meets on campus since it doesn’t meet CIF regulations. “We don’t have a real track or the equipment that we need, so we’re practicing at all these different places when we can,” said track captain Yanitza Padfield. The athletes and coaching staff wish they had more to work with but because of financial difficulties a lot of team fund raising has been done over the years. “Our school and athletics don’t take us seriously since we’re such a new program but the coaches and athletes are trying to change that,” continued Padfield. The softball team practices and hosts home games on campus on the field next to parking lots H and G, near Coyote Drive. The field was improved from 2001-2002 with renovations made to the dugouts and infield. Protective padding was added along the fence to meet the current California Collegiate Athletic Association requirements. The golf team hosts their own tournament at the Arrowhead Country Club known as the Dave Stockton Coyote Golf Classic. This is the only country club in the city of San Bernardino. Tom Self is the owner of the San Bernardino Golf Club located right off of Waterman Avenue. He’s been associated with the country club since he was nine and has accumulated a profound golf history. “I basically grew up at Arrowhead and I started playing there when I was nine,” said Self. “It’s had its great moments and is still a great golf course to play on today,” continued Self. The golf classic the golf program hosts there is a fund raising event that has accumulated over $600,000 for the 19 years it’s been held. The CSUSB golf team has had a string of success there, finishing in the top five against other schools this season and last year. Though some teams don’t have their own facilities on campus to hold meets and practice on, they continue to stay resilient and pursue their season goals.